This beautiful story contains something for most any reader-from angst and tragedy, to sweeping descriptions of nature, to encounters with the spiritual world, to triumph over adversity. 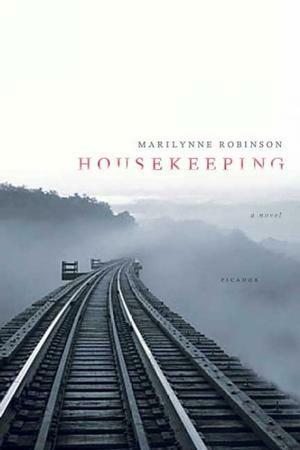 Ruth Stone, the main character in Marilynne Robinson’s Housekeeping, has hardly had an easy childhood. Ruth and her sister have been raised by a single mother who abandoned them to a previously unknown grandmother before committing suicide. They are then witnesses to the grandmother’s death, and forced to struggle with incompetent guardians. Bereft of parents and companionship save for her sister and her absent-minded aunt, Ruth looks to nature for solace as she mourns, especially the lake surrounding her small community. Ruth’s childhood is torn apart by death, and with this loss of innocence Ruth becomes a new person; one who is very aware of death. Robinson uses the change of the seasons and the states of the lake as a metaphor for Ruth’s personal, and for more universal, visions of death and rebirth. This often heart-breaking story is told from Ruth’s point of view as she attempts to make sense of the world around her, and find her place in it. How she eventually comes to terms with her unhappy childhood and finds a new destiny away from everything she has previously known is a story of triumph, and sorrow, hope and inevitability. Ruth comes to acknowledge the cycle of life and death, as illustrated by the ever-present lake surrounding her home, and emerges from the tragedy as a new person, replete in knowledge, and ready to begin a new life.